Decorated in chrome baubles with lovely blue accent pieces. This beautiful wreath unleashes winter's wrath upon mice that happen to wander in its way. Also looks great as a decoration on your own tree! The Festive Chrome Winter Wreath Trap Skin can be used on the Chrome Temporal Turbine. The trap's stats (power, power bonus, attraction bonus, etc.) are not changed. The Festive Chrome Winter Wreath Trap Skin may be made available during the annual Great Winter Hunt event and can be traded on the Marketplace or through Give To Friends. 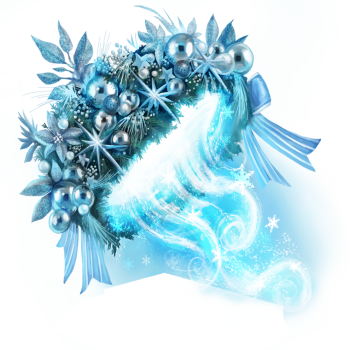 11 December 2018: The Festive Chrome Winter Wreath Trap Skin was released as part of the Great Winter Hunt 2018.